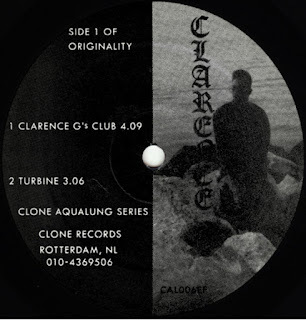 After 24 years Clone will be reissuing what they themselves are calling "previously one of the unaffordable holy grails of Detroit techno", the one and only Clarence G 12", Hyperspace Sound Lab, produced by James Stinson! So far they are listing it as upcoming but their Soundcloud link to samples of all the tracks list the release date as 1/12/15. You can listen to samples of all four tracks at this Clone shop link as well. The release will be coming out on their Drexciya and related sub-label, Clone Aqualung Series. Previously this record has sold for up to just over 700 euro on Discogs and possibly more on eBay so this is your chance to get it for a much more affordable price and in mint condition. The label artwork is the same with just the Clone address added in the same font. This is a very sweet release for the fans I must say and confirmation, if it were needed, that Stinson's production work as Drexciya and under his other aliases is truly revered in the 21st Century. It will be very hard to top this as far as reissues go, what could possibly be left over from the early days? I have previously written an in-depth piece about Clarence G here. Video for 'Data Transfer' from it below. Since 2003 Clone have been doing fantastic work re-releasing important pieces of the Drexciyan discography, first with the L.A.M. (Life After Mutation) Balance of Terror 12" which was produced by both Stinson and Donald just prior to Drexciya in 1992 and originally released on Robert Hood's Hardwax label. The same year they also reissued the sole and self-titled Glass Domain 12" which was produced by Gerald Donald and had been released on his own Pornophonic Sound Disc label in 1992. In 2006 they reissued some Der Zyklus tracks on a new 12" and in 2007 they did a reissue of Dopplereffekt's classic Gesamtkunswerk compilation from 1999. Then from 2011 they began releasing what would turn out to be a four part series, Journey of the Deep Sea Dweller, which featured a selection of Drexciya's music from 1992 to 1997 or thereabouts (it included unreleased material). But even before this they had built a relationship with the group and released albums by Drexciya (Grava 4), Der Zyklus (Biometry), Lab Rat XL (Mice or Cyborg) and even a 12" by The Other People Place 12".